When you buy a car, you make a long-term commitment to purchasing the fuel required to make it go. Which would you rather choose: electricity, a reliably cheap, domestic fuel that gets cleaner every year you own the car, or gasoline, a notoriously unpredictable fuel made with foreign oil that will only get dirtier over time? A year ago, violence broke out in Libya and oil prices surged. This year, experts predicted the cost of a barrel of oil would “skyrocket” if Iran closed the Strait of Hormuz. Thankfully, the regime backed down, but the posturing still sent oil prices soaring. These headlines invariably led to calls for drilling in our most wild places, an effort that would have no impact on gas prices. Meanwhile, electricity remained blissfully unaware of the political uproar, ticking along at a price that is roughly equivalent to buck-a-gallon gasoline. The Edison Electric Institute chart below contrasts the latest data for the two fuels. The blue line displays the price of electricity in “dollars per gallon equivalent” (the price at which the cost of driving a 30 mile-per-gallon conventional car is equivalent to driving a modern electric car). It never deviates far from the one dollar-per-gallon mark, following a predictable seasonal pattern with little variation. It is boring. 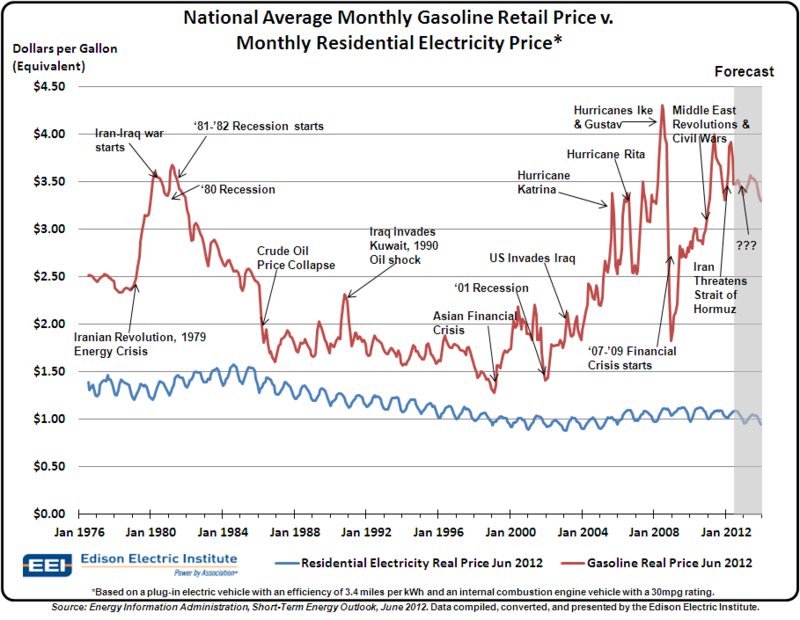 In contrast, the price of gasoline freaks out every time there is a recession, an international crisis, a hurricane, etc. Which do you think is a safer bet? The price of gasoline is directly linked to the price of oil, which is determined on a world market we cannot control. In contrast, the price of electricity is closely regulated by state public utilities commissioners. Following the 1973 Arab Oil Embargo, those regulators and the utilities under their jurisdiction made a concerted effort to rid the electric sector of oil. It worked. Today, electricity is virtually oil-free, made from a mix of largely domestic resources, including natural gas, coal, hydro, nuclear, geothermal, wind, and solar. That diversity, combined with the watchful eye of state regulators, results in a degree of inherent price stability that gasoline cannot touch. Electricity is cleaner too. On today’s mix of generation resources, driving an electric car emits half as much pollution as the average conventional vehicle. In states where electricity is cleaner, like California, electric cars emit only a quarter the amount of the average gasoline vehicle. When charged with electricity from renewable resources, plug-in cars are virtually emission-free. As old coal plants are retired and more renewable resources are integrated, the environmental benefits of driving on electricity increase. Twenty-nine states have policies in place that require increasing amounts of renewable generation. While electricity is expected to get cleaner, oil is expected to get dirtier. Big Oil is drilling in deeper waters, in more remote locations, using unconventional methods, seeking dirtier supplies like tar sands. Not a promising future. Interested in a different option―breaking Big Oil’s monopoly on the transportation fuel market? Check out one of many new cars models that plug-in to take advantage of buck-a-gallon fuel for life.